The Little River at Elkmont combines easy access, liberal casting room, and (mostly) willing fish, making it one of the easier fishing destinations in Great Smoky Mountains National Park. The best fishing is between March and October. This is a popular destination, so this is a great place to go in early spring or right before “leaf season” in the fall to avoid the crowds. You can have a dog on a leash in the campground, but not on the trails. Elkmont use to be a vacation community for well-to-do Knoxvillians, but now the area is a popular campground. By driving a little past the campground, you’ll find the decaying vacation homes of the past, and a great stretch of the Little River to fish. The old houses may give you the willies, but a lot of hikers and anglers alike enjoy exploring the remains of a bygone era. After walking down the Little River Trail a few hundred feet, you can immediately get into some great fishing, with many prime spots practically under the porches of the old homes. The fish here have less food opportunities than the trout downriver, so they are usually more eager to take a fly. You will mostly catch rainbow trout, but there are a few brown trout and native brook trout as you go further up. Because of the large campground, there are a lot of people in the high seasons and a lot of anglers when the fishing is good. Try to hit the river on weekdays in the chilly early spring or in the fall, right before the leaves start to change color. In general, a drag-free drift with nymphs or smaller streamers will yield success for fly anglers. Pay close attention to the wide and deep plunge pools. During the mid to late summer, a lot of locals use a greenie weenie as a dropper from a yellow sally dry fly. Conventional anglers should use an in-line spinner. This is a go-to spot for local anglers during hot months as an easier place to catch fish. 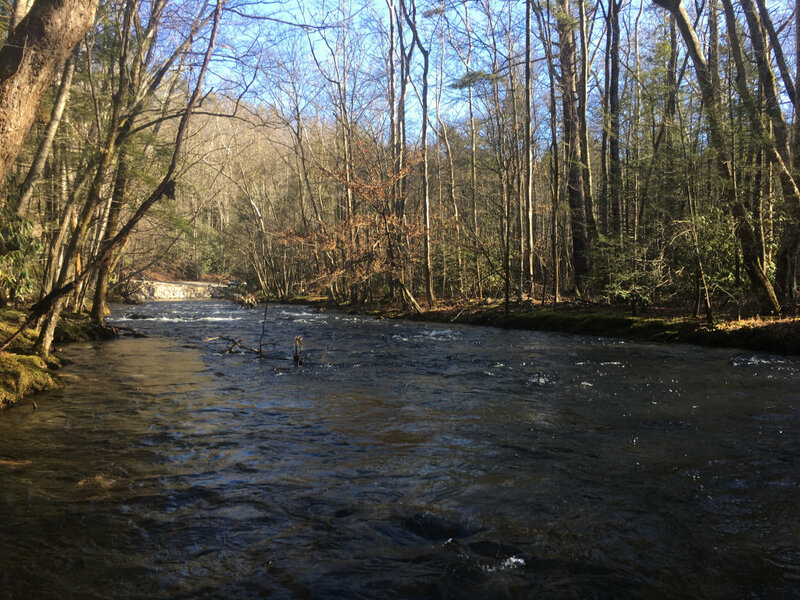 If you want to spend some time surrounded by beautiful scenery with relatively easy fishing conditions, then Elkmont is a great place to go. This is also a good spot for beginners or novice fly fishers looking to practice textbook fishing scenarios. Because it’s so close to the campground, this is a great place to set up a tent for some streamside car camping. Instead of driving into the campground, stay left and head to the Little River Trail parking area. Find a spot, rig up, and head down the wide gravel path and look for an opportunity to find the smaller path that parallels the river. As with all places in the park, a Tennessee or North Carolina Fishing License with a trout stamp is required. Natural or live bait is prohibited, as are double and treble hooks.